Seminarians are odd birds. We come from a variety of backgrounds all of us drawn by a vague notion of “calling.” We are dedicated though hesitant. We feel unworthy but at times our ego drives us, too. We’ve come to seminary to prepare for a life of service. We’ve come because we think education is important and we’ve inherited masochistic genes. We’ve come because we believe God is mysterious, and beyond comprehension, exceeding the greatest depths of human knowledge. And yet we believe God also desires to be known, can be known. Though never comprehended. 2) You wear a bow-tie and not ironically. 3) You have theological justification for why you listen to Taylor Swift. 4) You have (a more thorough) theological justification for why you don’t listen to Taylor Swift. 5) You regularly Instagram stacks of books. 6) You frequently add #blessed to your status updates. 7) You started putting a dime in a jar for every time you heard “you’re still in school?” and have used said money for Taco Bell. Twice. 9) You have a Hebrew tattoo. 10) You have a Greek tattoo. 11) You have both tattoos, on your wrist and foot respectively. 13) You’ve been shushed in your school’s library for sneezing. 14) At weddings you create drinking games based on references to 1 Corinthians 13 in the maid of honor’s speech (“Alright- one shot for every ‘love is…’). 15) Afterwards, you (kinda) feel bad. 16) You know that reading week really means feeling-guilty-for-your-Netflix-binge week. 17) At some point in your life, you’ve corrected someone’s pronunciation of Karl Barth. 18) You bring up predestination to break awkward silences (“So Calvin, what a stickler, eh?”). 19) You find CS Lewis cliché. …because ^ that’s not Ramen. 21) The best life choice you’ve made this year involved a bottle of cheap wine and a Systematic Theology take-home final. 22) The worst life choice you’ve made this year involved a bottle of cheap wine and a Systematic Theology take-home final. 24) Your little sister earns more money per hour than you do. She’s 16. 25) You stopped watching Rev. because it hits too close to home. 26) Your Bible software cost more than your car. 27) You’ve brought up dispensationalist theology on a first date…just to see if you should bail. 28) You once took portions of Augustine’s Confessions and put it to the tune of Usher’s Confessions which you proceeded to sing in the shower. All this before your first cup of coffee. 29) You’ve renamed the Starbuck’s where you study on Friday nights “The Naked Mermaid” so as not to feel so lame. Non-seminarians, please note: ^ that’s not us. 31) The more you learn, the more you realize how little you actually know. 32) The barista at the local coffee shop knows you as “Oh crap- it’s the one who pays with pennies”. 33) You keep your Greek and Hebrew flash cards in your back pocket, to review in grocery lines, waiting rooms and morning commutes. You’ve also mastered the art of steering while studying. 34) You take great comfort in reminding yourself that- worst case scenario- you’ll flunk out and be forced to make a better salary. 35) You get angry when the library closes at 5 PM on a Friday night. 38) You take personal offense when communion features grape juice instead of wine. 39) You started smoking a pipe because it goes with your tweed jacket. 42) Getting tipsy and dancing in your campus apartment is considered “scandalous”. 43) You love what you do. But every day you wake up and wonder if you’re really the right person for the task-maybe God screwed up? And every day you look in the mirror and have to laugh when you consider that the person looking back is some sort of spiritual leader. Pastor? You can hardly boil water for your ramen! And yet you remain. Today, tomorrow and a few days after that. And someday you may graduate and go forth. And that day will take care of itself. For now, you attend to the task at hand. 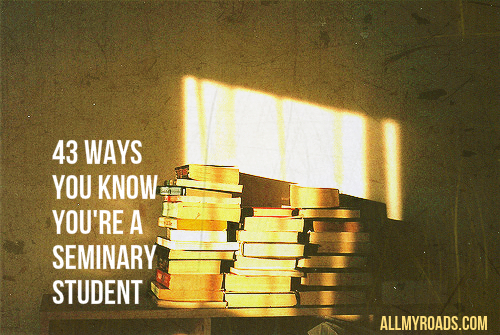 Because its seminary, its a journey, its life, its difficult, its marvelous. And perhaps you are incapable. Perhaps you’re a little inept. Of course you have skeleton’s in your closet. Of course your pride will get in the way. Of course your broken and tired and insecure and worried that you’ll screw up. The good news is you needn’t worry. Keep calm and study on; your Greek flashcards are calling your name. Because at the end of the day we know that we are not enough. But his grace is. That was awesome! Especially the t-shirt. It made me laugh.